Because of it's beauty it was chosen as residence by many monarchs in the centuries that followed. It now is the residence of His Royal Majesty Juan Carlos when he visits Seville. Pedro I, "the cruel" (1350 to 1369), made significant additions to the palace which is one of the most important examples of Mudejar architecture in Seville. The numerous rooms, patios and halls vary in architectural styles from the Islamic to Neoclassical. The beautiful gardens and fountains are especially worth visiting. (The Ambassadors Room): The magnificent dome of the Ambassadors Room is decorated with gilded cedar wood sculptures. The Ambassadors Room is decorated with tiles and complex plaster work. It has three semetrical arcs each with three horse shoes. This was the meeting place of the court before the hunt took place. 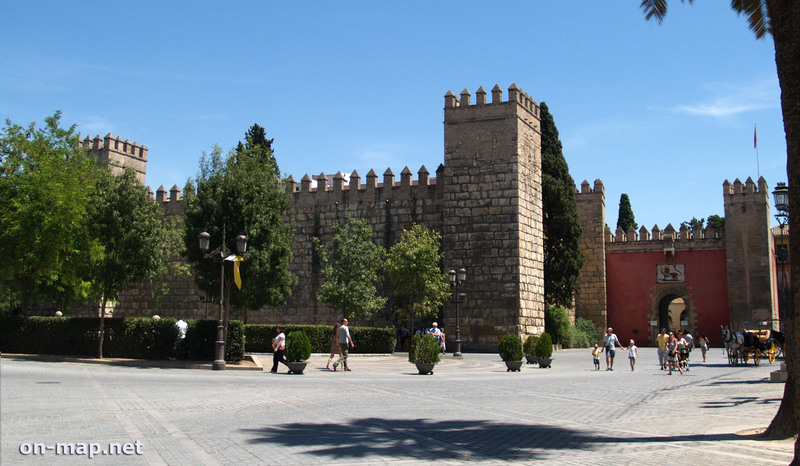 The faade of the palace of Pedro I is a unique example of Mudejar design. This beautiful, ornate garden full of flowers and streams maintains elements of the almohade architectural style of the Moors from the 12 century. This patio was decorated by the best architects in Granada. Patio del Crucero is above the ancient baths. The rooms and chapel of Charles V are decorated with tapestries and coloured tiles from 16 Century. This patio with its bedrooms and adjacent corridors was the heart of the palace. It takes its name from the two tiny faces that decorate its arcs. These gardens are modelled on those of the British Isles from 18 Century. The door to the Alcoba is of Islamic origin. The park was built in 1909 and the main gardener of the Real Casa de Campo, Juan Gras, was put in charge of planting the flowers. However, there are doubts as to whether his radical style fits in with the surroundings. The design of this garden is similar to that of the Forestier thanks to the influence of Joaquin Romero Murube. It's most emblematic feature is the two ponds that were inspired by the Arabs and Romans. This is a well designed garden inspired by the Damas even though it lacks the refinement that had once existed. This garden consists of 20 mostly square flower beds that are separated by paths and fountains. These gardens took their inspiration from Islamic culture and the Renaissance. This garden existed during the time of Charles V.